Our whole mindset is essentially based around what a project is and does rather than how it looks or appears. Strong intentions almost always result in strong aesthetics and pretty much take care of themselves. Form and space are our primary considerations and how these are brought to life with natural light is the key to establishing a successful interior. It is hard to imagine a serious architect that is not committed to the interior, the exterior, and every other aspect of his design. The interior is not only the driving force behind nearly every building project – it is the very reason for the project's existence…in the words of Lao Tse "The reality of the glass is the space within." While we always orchestrate the interior finishes, lighting, details, and colors, we sometimes find ourselves working with interior designers, especially for furniture selection. Designs for built-in and custom furniture are most often conceived by us in concert with the building and room design. WINDHOVER: A concrete Rumford fireplace is positioned against a wall of exposed aniline dyed 2x10 framing and cement backer board. The open portions between the framing allow light from an entry skylight into the main living space (1). LIEB RESIDENCE: Designed for baseball fans, some of the living room furniture reflects the sport via base-shaped end tables and a "Joe" chair. A Rumford fireplace faced with alternating bands of black granite and galvanized sheet metal ties the adjoining spaces together and provides a central anchorage (2). PINS SUR MER: Establishing a skylit entry in the central portion of the house allows crucial backlighting for every room in the house on this often fog-bound site.Tree trunk columns and a chandelier assembled from industrial lighting components help provides a no nonsense ambiance (3). 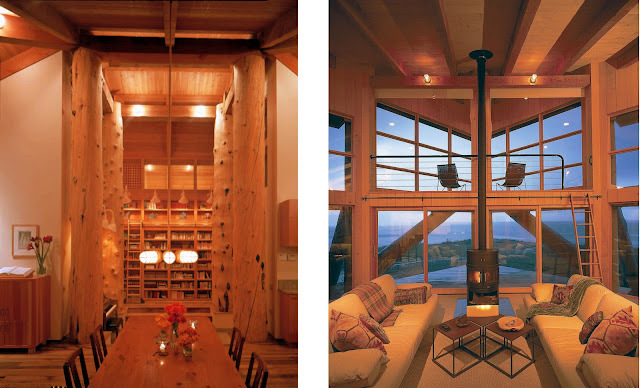 OREGON COAST HOUSE: The symmetry of the interior responds to the symmetry of the views which are both up and down the coastline.The cast iron stove backs up to a viewing loft above and glass doors leading out to the bluff below (4).